Reduce Excess Inventory. Reduce Working Capital. 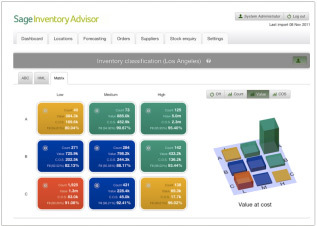 Sage Inventory Advisor is an affordable cloud solution that helps companies reduces stock outs, excess inventory, and working capital. It connects to Sage ERP data to deliver inventory health check, produce quality forecasts, reduce the time spent on manual tasks, and solve for the optimal investment required to achieve target fill rates. 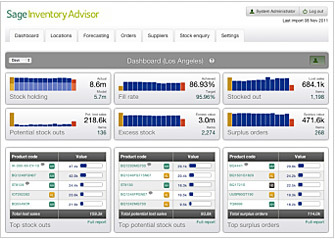 A web based mobile solution, Sage Inventory Advisor is easy to use and slashes time spent on forecasts and ordering. It can be implemented cost effectively and used in just hours. Track performance and identify problem SKUs through interactive dashboard with drill down features. Reduce excess inventory by 10%-15%. Reduce excess inventory by continuously monitoring all the risks inherent in the inventory and setting optimal safety stock to mitigate those risks. Reduce working capital and free up 15%-20% of cash tied into inventory. Identify potential problem items and get inventory level status based on calculated metrics to help make better planning and buying decisions. Improve fill rates by 2%-10% and eliminate stock outs. 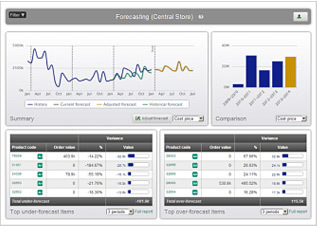 Reduce time spent on forecasting by 50% and save money. Eliminate manual forecast import/export and calculation and dynamically transmit inventory and forecast data for calculation and analysis. Focus on the items that matter to you with the value and velocity classification matrix. As a cloud-based solution, Sage Inventory Advisor can be implemented in just few hours and is accessible anytime, anywhere. It requires no local hardware installation and provides worry-free updates and maintenance.